The new Occupational health and safety standard ISO 45001 was released on the 12th of March 2018. It intends to improve the safety standards of the workplace. This standard will focus more on identifying and controlling the safety risk when compared to the OHSAS 18001 and AS/NZS 4801. Organisations already certified to OHSAS 18001 have three years from the 12th of March 2018 to migrate to the new ISO 45001 standard. Your existing certification body will send you information about the migration but you can expect additional audit days to be added to your standard surveillance audit. Organisations certified to AS/NZS 4801 currently can obtain non JAS-ANZ accredited certification to ISO 45001 with certification bodies planning to reissue the ISO 45001 certificates with the JAS-ANZ logo once it has been adopted by JAS-ANZ. Based on current information from Standards Australia, ISO 45001 should be adopted around October 2018. In ISO 45001 standard, a new clause “Context of the Organisation” will be introduced. It will determine and analyse internal and external issues of an organisation that can impact the objectives it in intends to achieve with its OH&S management system. Another difference between both the standards is that the new standard requires companies to assess risk management methods of suppliers and contractors. Every organisation needs to consider and control such methods for their contractors and subcontractors, in case they are outsourcing work. The current OH&S standard, which is followed globally for OH&S management system focus more on hazards of risk. However, due to growing number work-related accidents, ISO 45001 puts more importance on the identification of the risks of the organisation. Moreover, it also focuses on controlling those risks. A new term “Documented Information” has replaced “Document” and “Records” in the existing standard. This term covers the information, which is required to be maintained and controlled by an organisation. The documented Information must also contain information related to health and safety processes that are carried out according to the plan. a commitment to consultation and participation of workers, and, where they exist, workers representatives. The requirements for the identification of hazards and what you need to take into have been expanded. One item that stands out is the requirement to take into account “how work is organised, social factors (including workload, work hours, victimisation, harassment and bullying), leadership and the culture of the organisation.” when identifying hazards. Given that ISO 45001 has a risk-based approach to management systems it is up to the organisation to determine what documented information will be retained to demonstrate compliance. Examples of this include emails, videos, forms, chat messages, software and photos. When determining what documented information is required you’ll need to take into account legal requirements, e.g. SWMS and WHS Management Plans. The procurement process needs to define and apply criteria for the selection of contractors. Outsourced processes need to be identified and controlled, the degree and extent of control should be relative to the contractors risk profile. Previously in AS/NZS 4801 you were required to establish procedures to identify and have access to all legal and other requirements that are applicable to the organisation. ISO 45001 requires organisations to evaluate their compliance with legal and other requirements and retain documented information of the evaluation results. For organisations already compliance with ISO 14001:2015 for environment this is something you’ve already had to consider. For organisations that have existing health and safety management systems. 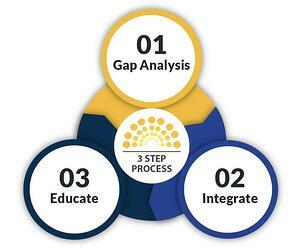 Compliance Council have a simple 3 step process for migrating to ISO 45001. You can’t effectively migrate without understanding how your existing management system aligns with the standard. You have the opportunity to refine your processes and integrate them with your quality and environment management systems. Given that the majority of ISO 45001’s requirements follow the same high level structure as ISO 9001 and ISO 14001 it will be a very straightforward project to integrate the processes.